We have been fielding a lot of questions from investors recently on the US dollar (USD). 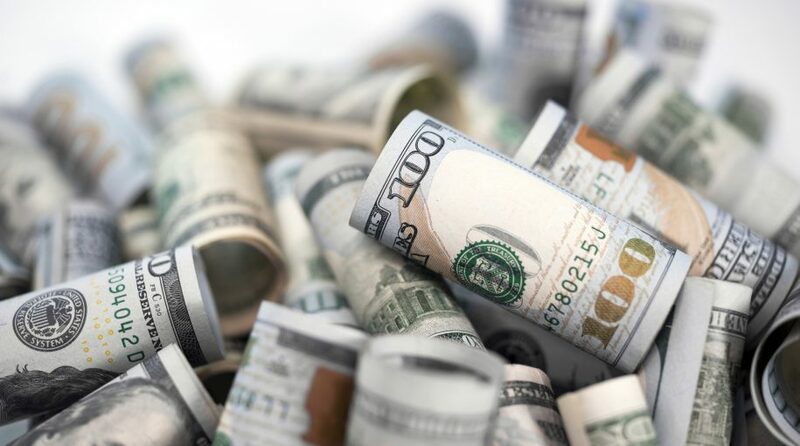 It can be tough to make a blanket statement about the greenback, as a forecast often depends on which currency is used in the comparison. But for the purposes of this piece, we’ll discuss why we continue to think that the USD is near a structural high versus many currencies, and the implications of this view on our asset allocation portfolio positioning. Last September, we published a Weekly View (9/11/18; ‘Special FX’: Why RiverFront Isn’t Currently Hedging Major Foreign Currencies’) explaining why we were choosing not to hedge the predominance of our portfolios’ FX (foreign currency) exposure. Our opinion was that the USD was close to an intermediate-term peak, a controversial view after the strength in the dollar during 2018. 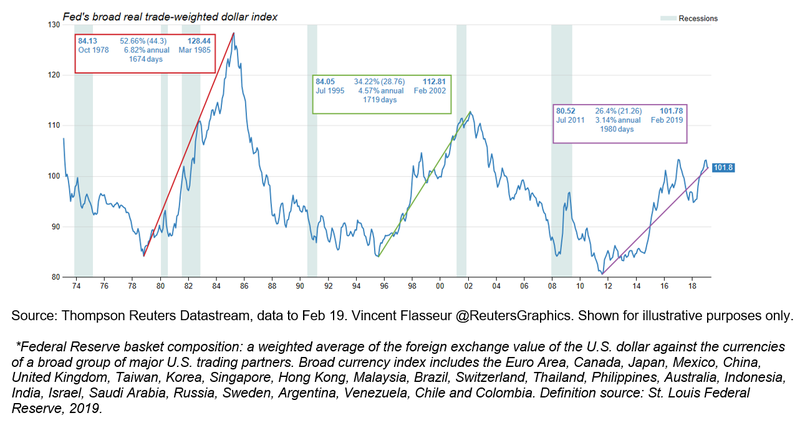 This contrarian view was based on our opinion that the dollar was generally overvalued after the longest bull market for the USD in four decades (See Appendix chart on long-term dollar trends, page 3), and that at some point moderation of the economic growth differential between the US and foreign regions would likely halt the USD’s rise. We still adhere to this general view, for reasons we go into greater detail below; however, our view on European currencies has become less optimistic. Since that publication, the USD has traded within a relatively tight range to most other developed market currencies. 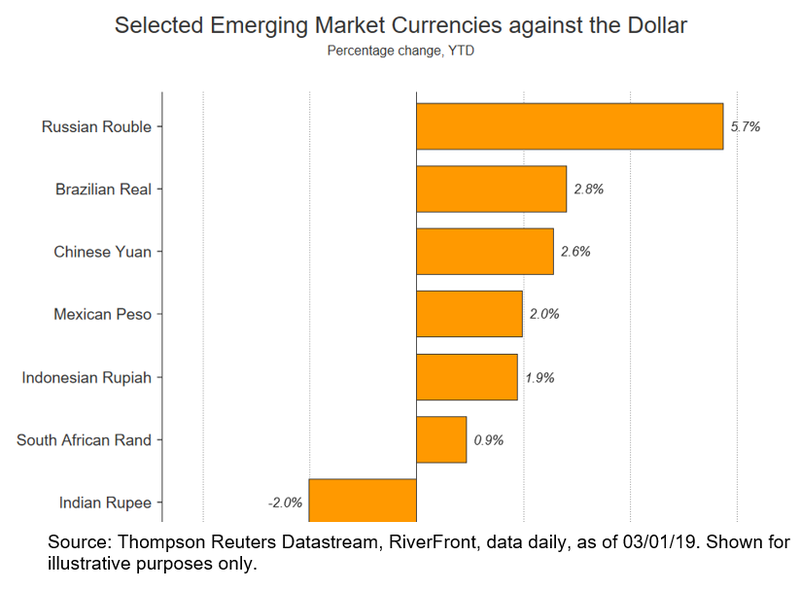 Notably, however, the USD weakened meaningfully versus many emerging market (EM) currencies, including the Chinese yuan and many Asian and Latin American currencies. We believe that this phenomenon has helped the bottoming process in emerging market stocks and currencies since the fourth quarter. EM currencies likely to remain stable; Yen dependent on global growth; Euro & Pound linked to geo-political outcomes. Partially due to our sanguine view on the USD relative to Asian and EM currencies, RiverFront is overweight emerging market stocks and EM debt in our longer-time horizon, more risk-tolerant portfolios. We also remain overweight Japanese assets, a view that isn’t primarily related to our view on the yen but isn’t in opposition to it either. We don’t have a strong opinion about the yen currently. Though we believe it’s structurally undervalued and that the Japanese economy is in better shape than is commonly thought, we also recognize that the yen is sensitive to global risk appetites, as it tends to strengthen when investors become risk-averse. With markets bouncing back so far in 2019, perhaps it’s not surprising that the yen has been unable to strengthen this year. Due to risk factors that may impact both stocks and FX, we remain underweight European equities for now in our portfolios – and thus, inherently underweight the Euro and the Pound. Going forward, we anticipate further near-term uncertainty due to Brexit and other political issues in Europe. This underweight is also partially technical in nature, as many European markets have rallied into their 200-day moving averages, which may prove to be formidable resistance. Specifically, the Euro has traded consistently below the decision box we laid out in September, which may indicate a new lower trading range (See lines on chart, right) and further potential future weakness in the future. 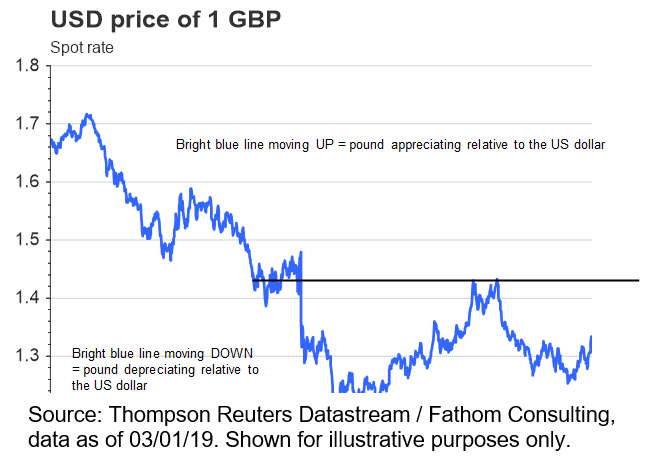 While the Pound has been stronger recently due to increased hope that Brexit will be delayed or possibly rescinded, it has only rallied back to the middle of its trading range where we believe risk-to-reward is mixed at best. Both European currencies appear to us to be beholden to the perception du jour around Brexit, Italian and French political outcomes. 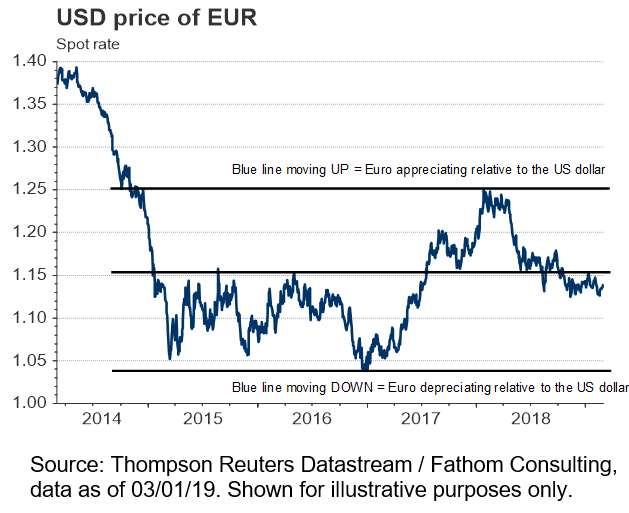 Given our long-term view that most European currencies are cheap and long-term mean reversion potential for European stock markets is strong, we are monitoring Europe’s economic and political fundamentals closely for any signs of improvement. The structural ‘bull’ case on the USD can be boiled down to four arguments, each of which appear reasonable. First, dollar bulls point to the relative strength of the US economy. Second, higher interest rates in the US resulting from the Fed’s normalizing monetary policy will attract yield-seeking investors. Third, the dollar will rise due to the U.S.’s continued status as a ‘safe-haven’ currency given its size, liquidity and productivity. Finally, dollar bulls point to the end of extraordinarily easy monetary policy at the Federal Reserve as further rationale for dollar strength. We do not dispute the logic of those making the case for additional upside to the dollar. However, we believe that the bull-case is widely-understood and thus potentially already priced into the rich valuation of the dollar on many currency valuation models. In our opinion, this makes the dollar particularly vulnerable to future changes in these three arguments. We would also note that investor sentiment on the dollar appears to be starting to decline from an optimistic extreme made earlier this year. High and falling investor sentiment has historically resulted in subpar forward performance over the past 15 years, according to Ned Davis Research’s Daily Sentiment poll for the dollar (source: NDR Research, 3/2/19). Past performance is no guarantee of future results. From a fundamental perspective, we also see several counterpoints to what we view as consensus thinking on the dollar. Currency markets attempt to discount future changes in fundamentals at least as much as the current state of fundamentals First, while the US economy is indeed the world’s most productive and continues to outperform Europe and Japan, there are increasing signs that the US is slowing too. Economic surprises have turned negative in the US, and ‘soft’ survey data such as manufacturing PMIs and small business optimism have recently started to moderate. Also, we believe that Asian and EM economies are likely to stabilize in the second half of the year, led by China’s widening program of monetary and fiscal stimulus. Struggling with growth, other EM economies such as India are also beginning to stimulate and have a long runway for additional stimulus given the lack of inflation in their economies. Second, with the Fed’s dovish ‘about face’ in January and the bond market pricing in close to a 90% probability rates remaining at current levels or lower, it’s harder to make a case for additional dollar strength in 2019 due to rising interest rates. Third, the dollar’s ‘safe-haven’ status could be challenged by our trade and budget deficits, with $1T-plus deficits starting in 2020 serving as a potential long-term headwind. Political uncertainty in the U.S. may also increase later this year as we head towards a contentious 2020 Presidential election.